A very versatile shell enclosure with sloping display area. Recessed area for membrane keypad. Battery options include: 2AA, 3AA, 4AA, 1 or 2-9V and No battery. 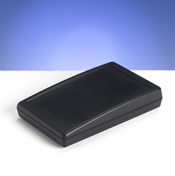 90 Series Slope Case, 3 AA batt. 5.7 x 3.6 x 1.3/1.65"
5.7 x 3.6 x 0.90/1.25"
5.7 x 3.6 x 1.15/1.50"
90 Series Slope Case, 9-volt batt. 5.7 x 3.6 x 0.85/1.20"
90 Series Slope Case, 4 AA batt. 90 Series Slope Case, 2 AA batt. 5.7 x 3.6 x 0.75/1.10"
90 Series Slope Case, No batt. 5.7 x 3.6 x 0.45/0.8"
Height Expander - adds 0.50"